The Hebrew root קבל, Kabbal, means to receive. The noun קבלה, Kabbalah, means reception. In common usage when the desk manager at a hotel in Israel answers the phone, he says קבלה, Reception! In the religious world Kabbalah is the area of knowledge by which one learns about receiving from the Creator. The Kabbalah of Science, קבלה מדע; has the meaning of receiving from the Creator through the knowledge area of science. The Jewish Kabbalistic teaching is that everything we personally encounter in the world is coming from the Creator as a Holy gift to us. We can receive it and thereby take delight in its holiness, or we can reject it and its holy delight. This is an exercise of our free will. There is no compelling force that constrains us to do one or the other. Over the centuries, the commentators on Torah and the Kabbalists have written much on this point. Here we make no attempt to encapsulate this entire body of teaching. We only touch on one point: that the intricacies of the regularities in our physical universe, the laws which describe the way the universe runs, are wondrous. They are wondrous in each detail and in each area of scientific knowledge. Learning the laws that are known or even discovering the laws is an intellectual endeavor that is self sufficient. The activity does not need acknowledgement of the Creator nor does it need the receiving of the knowledge wrapped in the gift of holiness. That is the secular level, a level that believes, and behaves accordingly, that there is no spiritual dimension to creation and that there is no Creator, no God. However, there is another dimension that can be lived and experienced in our world, the spiritual dimension. This dimension of reality cannot be understood from the outside, in an objective public scientific manner. Reading about it as an outsider will make no sense. It can only be experienced and received from the inside by those who are open to it and who have disciplined their consciousness to live such receptiveness. From the experiential side, the Kabbalah of science is the acknowledgement and the description that in and through all scientific knowledge, if we choose to be open to it, we can receive holy delight as a gift from the Creator. From the technical side, one dimension of the Kabbalah of science refers to the use of mathematics, computer science, algorithmic search methods and the discipline of probability and statistics by which proper experiments of Torah codes can be designed and their results analyzed. The time for the blossoming of this reception begins from 5736, 1976. This is the time that Torah Codes began to be discussed in Israel. It is the time of the beginning of the era of the Messiah, and the time of the beginning of the prophet Elihayu returning to announce the coming of the Messiah. 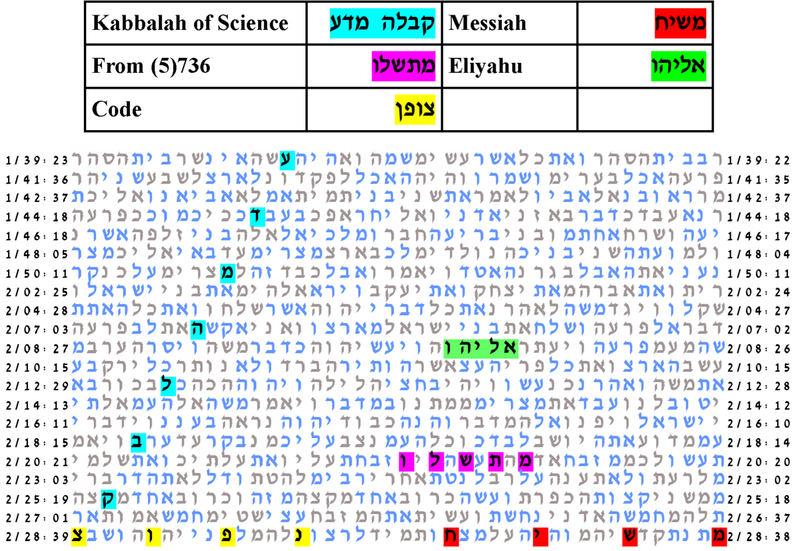 All this motivates the table below, which has key words for Kabbalah of Science, From (5)736, Code, Messiah and Eliyahu. With the expected number of ELSs set to 100, the probability that a text from the ELS random placement text population would have as small an area table as that produced by the Torah is 55/10,000. The expected number of ELSs was set to 100. The cylinder size is 3075. The probability that a text from the ELS random placement text population would have as small an area table as this one is 55/10,000.